The domain name cancerplants.com was registered by Dr. Ingrid Naiman on 7 July 2002 as a collaborative effort to draw wildcrafters and herb growers into a network that included formulators and producers of herbal medicine as well as marketers, health care professionals, and patients. Hosting has been ongoing since 25 January 2003. In Autumn 2018, several proposals were made to create sustainable botanical gardens throughout the world, starting with a garden specializing in cancer plants. Kitzia Kokopelmana made this suggestion and it was immediately embraced by others who have begun planning gardens, farms, and plantations in the Caribbean, Pacific Islands, Andes, Himalayas, and hopefully soon Africa and Asia. The primary goal of CancerPlants.com is to promote understanding of medicinal plants that aid in the treatment of cancer. To fulfill this purpose, user-friendly sketches of herbs are presented and networks are supported to encourage protection of wild plants, to plant endangered species in suitable and pristine environments, and to create farms and botanical gardens that are scaled to local needs — everything from schools and hospitals to plantations. In addition, seed banking and seed exchanges are encouraged and plans are shared to enable people in all parts of the world to develop plant sources for the unique needs of their regions. The site is not intended to become either a scientific resource or database, rather a bridge between the needs of patients and hobbyists with professional herb growers and medicine makers. The focus is a little more ethnobotanical than most sites and definitely more clinical than theoretical. Ultimately, the purpose is to protect health for generations to come by furthering the understanding of medicinal plants and their proper uses. What you will find on this site are many short sketches of herbs with explanations of their traditional and modern uses as well as instructions for cultivation. As the work progresses, there will be designs for gardens and processing laboratories as well as manuals for use in clinics. Videos will also be added. 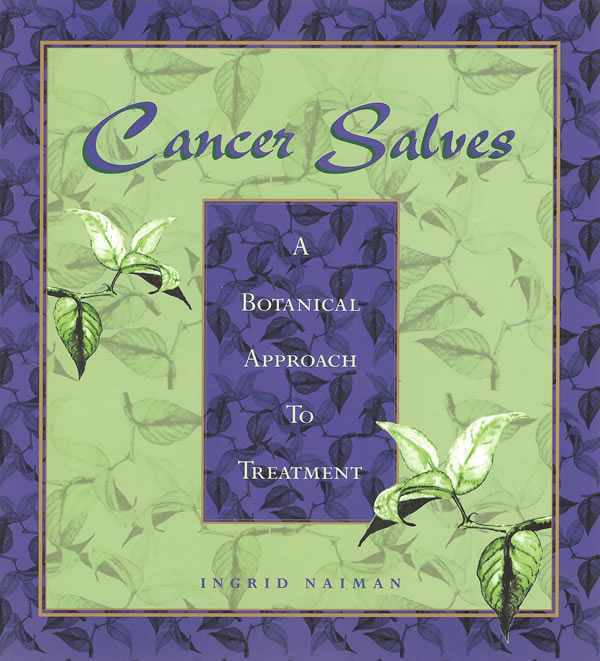 The enhancement of the site is being undertaken in November 2018, two decades since the publication of Cancer Salves, A Botanical Approach to Treatment, a book that took ten years to research and write. Since the publication, I have lectured and consulted in many countries, and the book has been translated into German, Bulgarian, and now Spanish. Herbs can be used to reduce the risk of cancer and other diseases, to alleviate symptoms, to lessen the side effects of modern treatments, or as holistic and non-toxic alternatives to conventional options. To further this work, I have joined forces with Kitzia Kokopelmana to develop gardens that supply the plants needed for juicing and good nutrition as well as for making foods that are high in antioxidants. Of course, she will also be growing the plants needed to make excellent herbal remedies. Others are welcome to come on board, to pursue similar projects in their own communities, to exchange information and ideas, and eventually to intern on farms and in clinics. Of course, those with expertise are welcome to use this site to share their knowledge with others and this site will be linked with the Institute for Invisible Epidemics and its Academy so that online education can make the material available to all who are interested. If you are an ethical wildcrafter or organic grower, this site can be used to further awareness of your work and your products. Educators can contact us about papers they would like published or courses they would like to teach. Video submissions are also invited. For those who are suffering from cancer, from the fear of cancer, or who are researching options for someone else, many of the plants discussed here are available under the Sacred Medicine Sanctuary label. These include teas, topical ointments, powders for making poultices and boluses, as well as many herbs in liquid form, both single and blended formulations. Most of all, the purpose is to reduce and ultimately to end suffering. That is my wish.